Have purchased a couple of Westphalian units from Stuart. Good quality work, well packed for shipping (even across the Atlantic) and easy to work with. Thanks! I have purchased various Napoleonic units from Stuart and have always been very happy with the quality of painting. The figures have always arrived promptly and in excellant order. 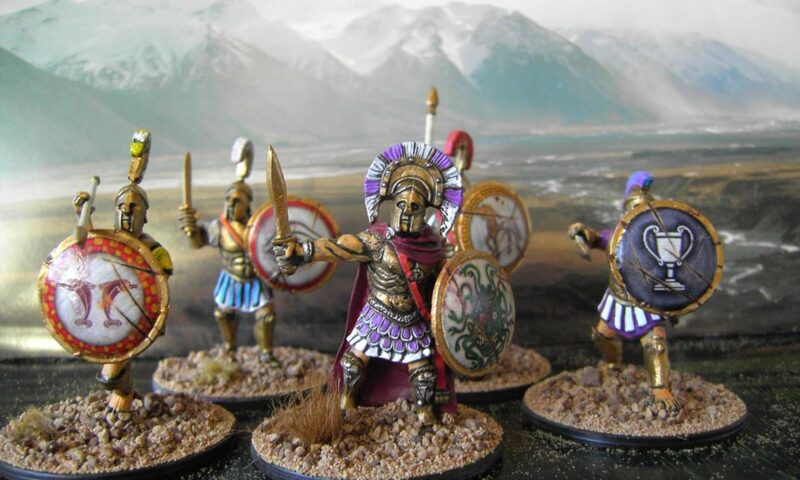 Stuart has painted and supplied 55 Ancient Greek Hoplite figures (28mm Foundry) which have been painted to a high standard – probably too good for the wargames table! Each figure has been individually painted to give a really good look for a ‘Citizen Phallanx’ and very reasonably priced. His postage and packaging is good and all arrived safely. I have been collecting figures of various scales for years. Stuart is somehow able to achieve a very high standard of detail while at the same time he is able to maintain a very high rate of production. The only conclusion I can draw from this is that Stuart has a half-dozen elves working for him on the night shift! (if rumors are true,he pays them with fish) Whatever this well-kept secret to Stuart’s speed painting may be, it is very good for the collector since figures of excellent quality can to be purchased at a very reasonable price. I am a very pleased and happy customer. Please disregard as references to fish and and elves. I have puchased multiple units of painted 25/28mm Napoleonic figues from Stuart. The quality of the painting is excellent, the service is friendly, and packaging/shipping (to New Zealand) is fast and professional. I highly recommend Stuart and his products. I have bought a number of units from Stuart and I am extremely pleased with both the paint job and the service I have received. I would highly recommend Stuart. Stuart has been painting for me for over 15 years.Everything from single figures to full diaoramas.From 25mm to 120mm.He has done Zulu war,WWII,Fantasy,Falklands,Boer war,Gulf war,Wild west and sci fi.He has all so painted for my wargames club.I have all ways found his work to be to the highest standard.I have allways found him to be a very decent chap to deal with and would highley recommend him to anyone. Nice figures. Good price. thanks a lot! The quality of the painting is excellent .His packaging and speed of postage were first class. Very happy . New ACW fig. arrived .they are perfect . Thanks Stuart . In Vlemisch ; Goed en perfecte figuren en correcte service . Hoop to here about officers on horse. Clear line of communications. No nonsense approach. Good packaging and delivery is prompt. Recommended without hesitation. I recently impulse-bought a unit of Stuart’s hussars on e-bay. Really impressed with the quality. No rush-job here. Each figure is precisely assembled with flash and mold-lines carefully removed. Stuart obviously undercoats carefully and keeps his colours deep and rich with a nicely crisp contrast between the light and shadow areas. His figures hit that often-elusive sweet-spot by looking really good close up and from a distance on the wargames table too. I will certainly be buying more figures from this accomplished artist. Many thanks Stuart. Very impressed with the speed and quality of the two units of BEF 1914 British that I bought. Every now and then there is a little touch that is brillient such as the officers silk scarf. Will definately use in the future. I bought a unit of 28mm ACW cavalry from Stuart on Ebay. Really excellent paint job and basing and also friendly communication and speedy delivery in my far away corner of the world. Thanks! I recently suffered a bout of impulse buying on eBay: got a unit of WWI troops from Stuart and haven’t regretted it one moment. Expertly painted, they easily outshine any other miniatures on the wargames table. Good packaging and delivery is prompt.The quality of the painting is excellent . Recommended. Will definately use in the future. Stuart’s work is very good for the price he charges and he has a very fast turnaround. I have a lot of work lined up for him in the future. I have purchased a number of items from Stuart. All have been of a high quality and I have found him to be amiable and communicative. I have no trouble in recommending Stuart as a provider of figures for your gaming needs. Just one thing though, don’t over load him with orders as I’d like to get some more in the near future. The Austrian Napoleonic Grenadiers Stuart painted for me are excellent, just the way I like my figures to be. The quality and value is exceptional, many more figures from me will be heading Stuart’s way very regularly. I live in the United States and have been buying Napoleonic miniatures from Stuart for the last several years. His figures are painted beautifully and his service is impeccable. He is easy to work with and his figures always arrive quickly and are perfectly package. I will be buying figures from Stuart again and again. Buy with confidence you will not be disappointed. Thanks for all your great service and figures. All the best. Cheers!! Angelo. I have purchased many of Stuart figures over the past year. Everything he has done for me is painted to profection. Stuart is very professional and does excellent work. Packaging is top notch and none of the figures have been damaged. You will not be disappointed in any of his work. Great figures and great service. Stuart always accomodates what you require from a painter. Affordable prices and good quality, if you need whole units or to make up the numbers. Been to a number of other painters and Stuart’s the best. I have purchased some Spanish Figures recently and they were excellent (as were the previous French Infantry). Turn round quick, response quick, accuracy excellent and overall very happy. Many thanks indeed. I have purchased painted Napoleonic figures and had 18thC SYW figures painted for my by Stuart Foley. The painting was excellent and my specific painting requirements in terms of uniforms and colours were met every time. I will be using Stuart again in the future to build up my armies. 1) he’s professional and punctual. You pay up front, but you’re going to get exactly what you expect, exactly when it was agreed upon. 2) his quality is top notch. 3) you get notifications of parcel arrival, progress shots along the way, confirmation of shipping, and tracking numbers. This may sound par of the course, but I’ve worked with painters who communicate considerably less, and this hands-on approach really keeps you engaged in the project and you know what’s going on. I’ve never seen Stuart’s personal life interfer with his painting business, he runs it likes a 9-5 ‘shop,’ and you get with that all the professionalism that you would expect and desire for your money. And the minis look bloody lovely (and DAMN he is quick). An absolute staple god-send of a painter in the industry and someone I’d always recommend to anyone else. Having initially purchased a couple of units painted by Stuart to add to my 28mm WSS collection, the majority of this is now composed of Foot, Horse and Artillery figures supplied by this master painter – and they are uniformly the best figures in the collection. I’ve particularly appreciated both Stuart’s fast turnaround times and, above all, his unstinting efforts to query and then meet my exact requirements. Thank you! I highly recommend using Stuart’s painting service. The last 7 months he has painted 500 28mm AWI and Nappy figures for me. Very fast painter. Very knowledgeable about each period. (I even learned about the different waist coats for AWI from him). He interfaces with you to make sure he has the right uniform you want and then paints to a good standard. I will 100% be using his service again.